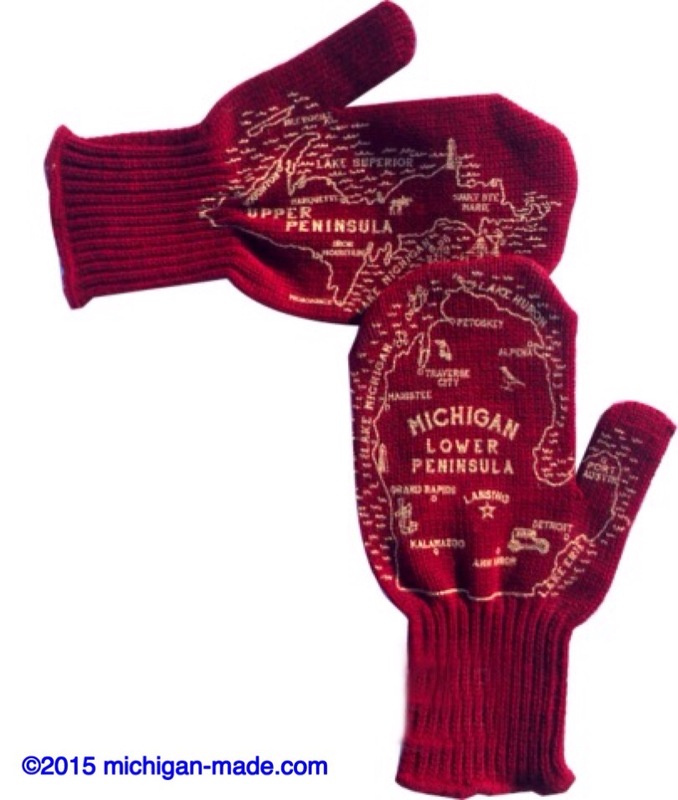 Ask most Michiganders where they are from and watch them pull up their trusty maps attached to the ends of their arms. Pardon the pun, but it can be quite handy at times! 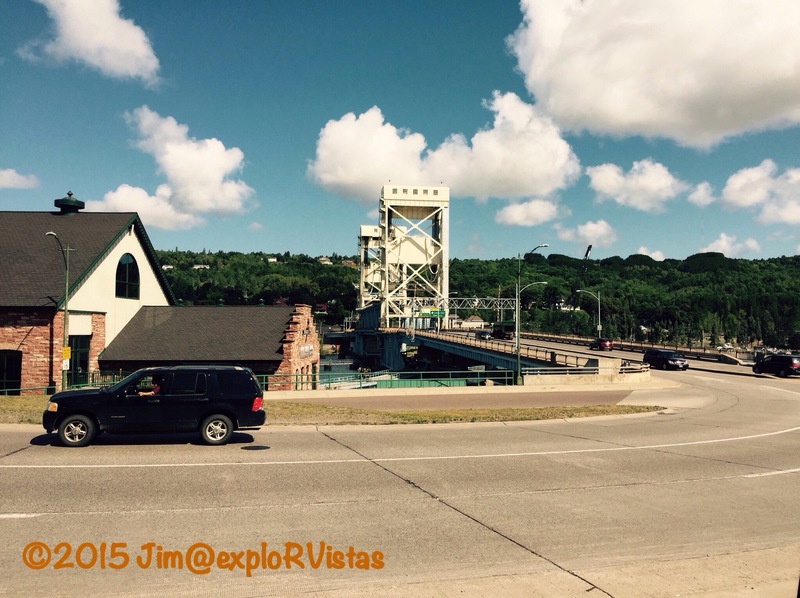 On Wednesday, we visited Michigan’s left thumb, the Keweenaw Peninsula. Jutting halfway across Lake Superior, the peninsula is home to one of the oldest known lava flows on the planet. Copper is king here, as those flows deposited easily recoverable ore and pure veins of the metal. Before the mining boom in the 18th century, pure copper could readily be found on the surface. 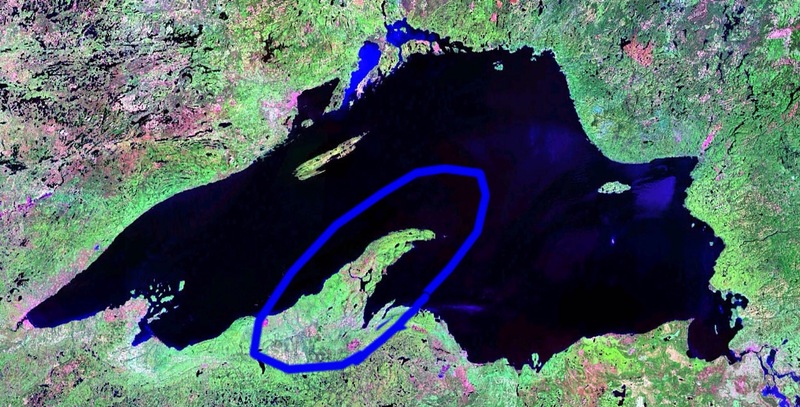 About a third of the way north, the peninsula is traversed by the Keweenaw Waterway. Points north of that are unofficially known as Copper Island by local residents. The only road across the canal is the Portage Lake Lift Bridge, which carries US 41 northward between Houghton and Hancock. Climbing the hill out of Hancock, the Quincy Mine hoist comes into view. Recently restored, the hoist is the centerpiece of the Keweenaw National Historic Park. 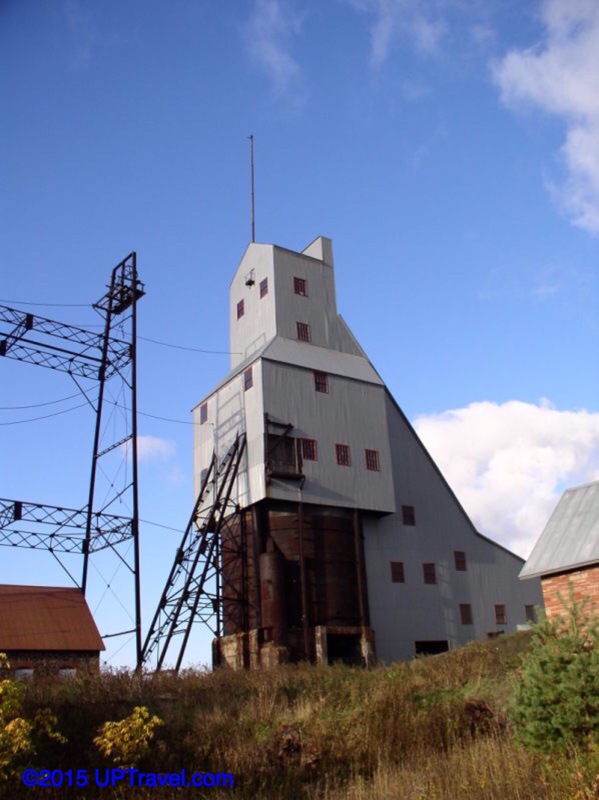 Though we chose not to go on one this time, tours of the mine are available. With the peninsula jutting so far out into Lake Superior, lake effect snow is a force to be reckoned with up here. Along US 41 to the north of Calumet is the Snomometer. The area averages 20 feet of snow each winter. 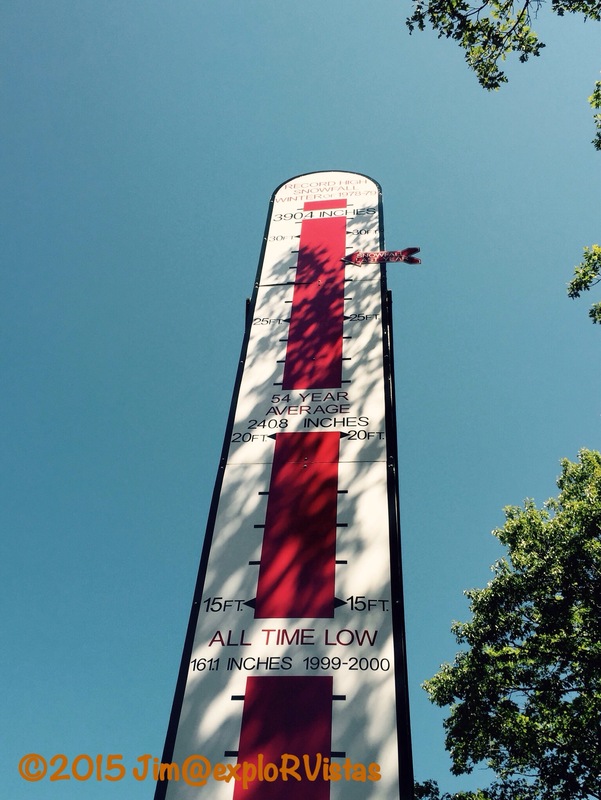 Last year’s total was over 28 feet. That’s a lot of snow! 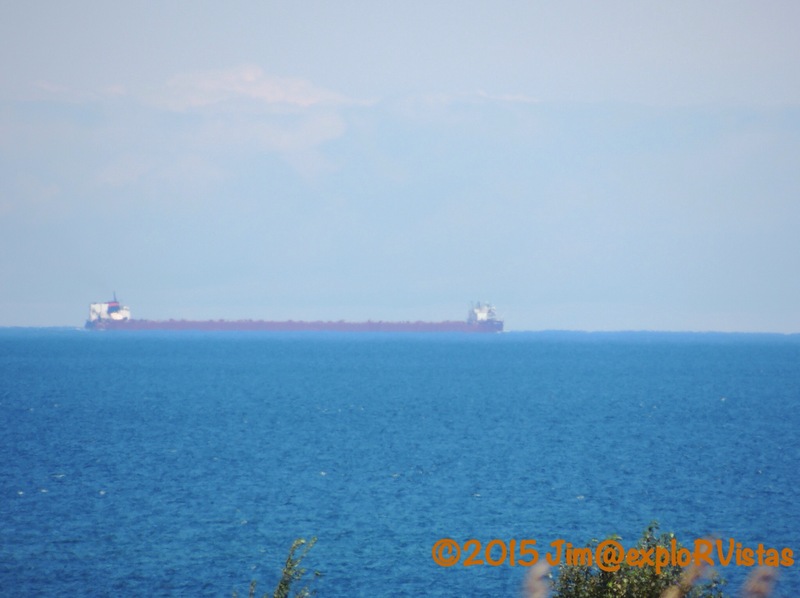 While driving along the northwest shore of the peninsula, we spotted a freighter off in the distance. As best I could tell from that distance, I identified it as the Stewart J. Cort… by it’s stack colors, and also it is only freighter of that length with a forward pilot house. This ship was the first 1000 foot freighter on the Great Lakes, and it still carries the proud “#1” painted just forward of it’s stack. I remember the day in 1972 that my paternal grandfather came over and told me he had just watched it glide up the Detroit River on it’s maiden voyage. Farther north, we came to Eagle Harbor. The bay has a small entrance in the rocky outcroppings extending from each side. The Eagle Harbor Lighthouse stands as a sentinel over the shore here. 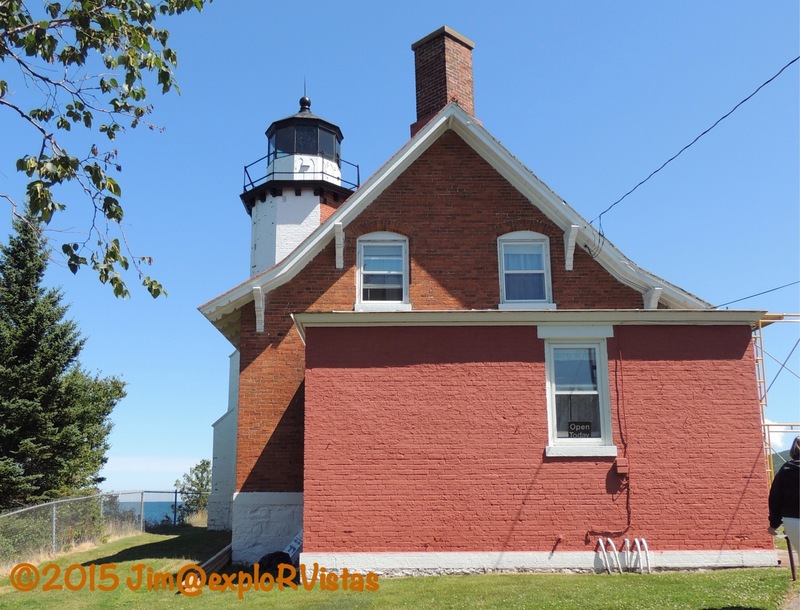 The first lighthouse was commissioned here in 1851, and the current building was brought into service in 1871. The light is still in use today. There is also a set of range lights to guide watercraft into the small port. The house and the surrounding buildings are open to visitors as a museum. We visited and enjoyed it, but FYI…the lantern room is not open to the public, as it is a working lighthouse. The craggy shoreline is reminiscent of Downeast Maine and is very picturesque. From Eagle Harbor, we had the choice to continue northeast on either US 41 or on Brockway Mountain Drive. We chose the latter. Be advised that at the time of our visit, the road was in moderately poor condition. With that being said, the views were well worth it. The drive was a CCC project in the 1930’s that was undertaken to keep unemployed copper miners working during the Great Depression. 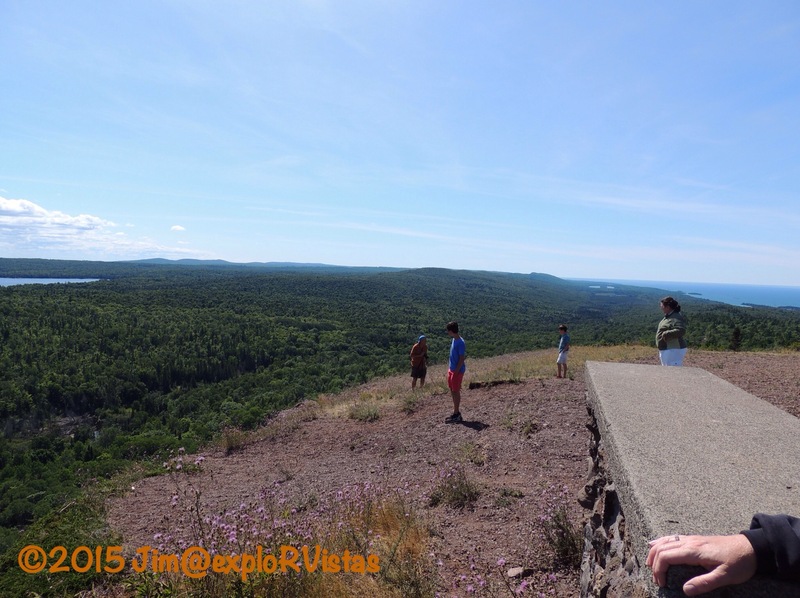 Climbing along the ridge of Brockway Mountain, the road offers outstanding views of Copper Harbor, Eagle Harbor, Lake Superior and (on a clear day) Isle Royale. 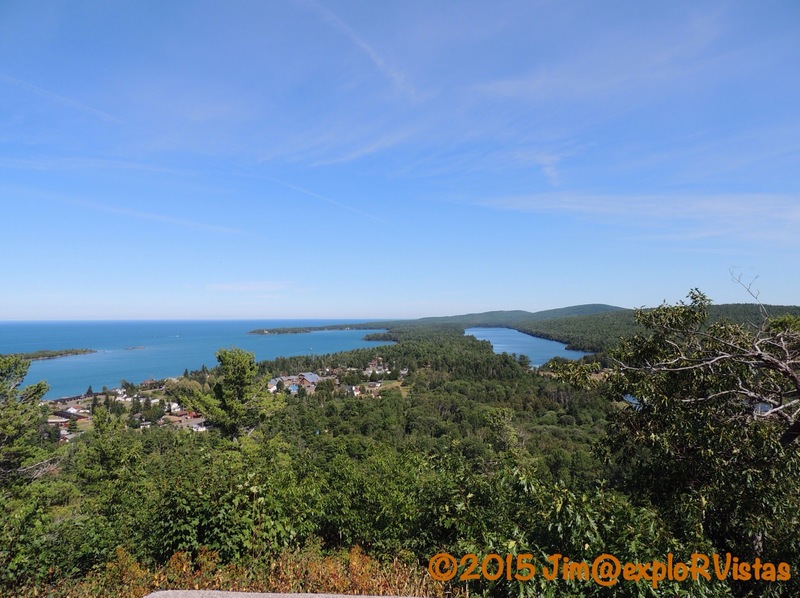 Here is the view from the Copper Harbor Overlook. Copper Harbor is to the left, Lake Fanny Hooe is to the right and the village of Copper Harbor is in the foreground. 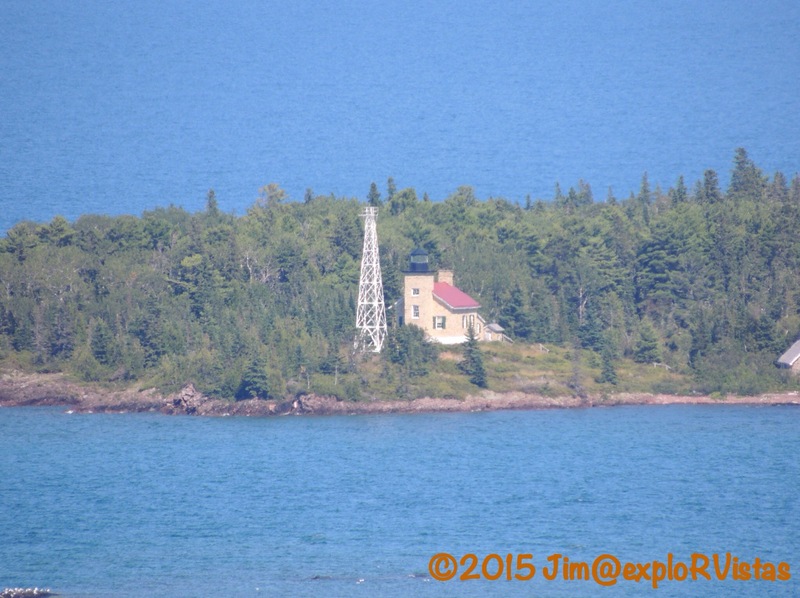 At the Far East end of the harbor is the Copper Harbor Lighthouse. The lighthouse…the second at this site…was pressed into service in 1866. It was deactivated in 1933, when the automated light on the steel tower was commissioned. The lighthouse is open as a museum, accessible by ferry from town. 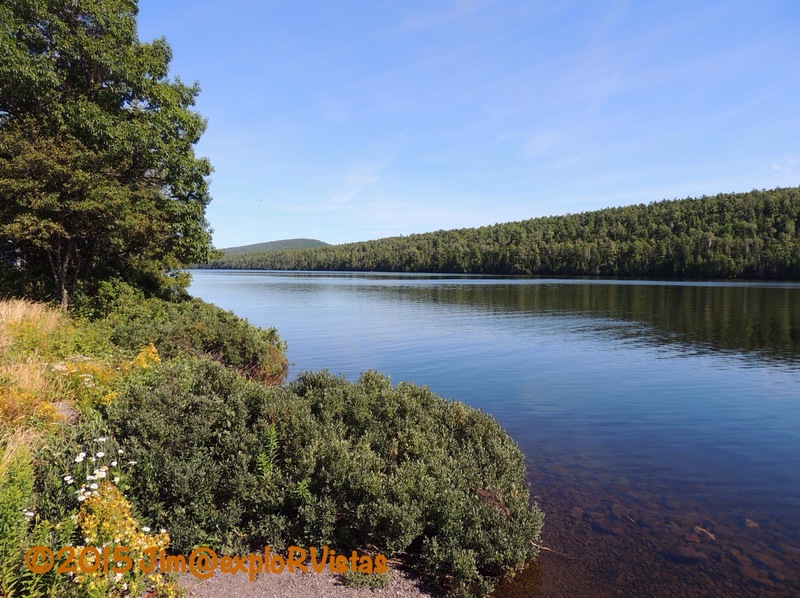 Beyond the village of Copper Harbor lies Lake Fanny Hooe. The lake was named for Lucy Frances Hooe, who legend says drowned in it’s waters in 1844. It is a very peaceful setting in August. Let it be noted that we have been here in the past when the biting black flies were active, and it wasn’t so pleasant. The flies are usually at their worst in spring and early summer. 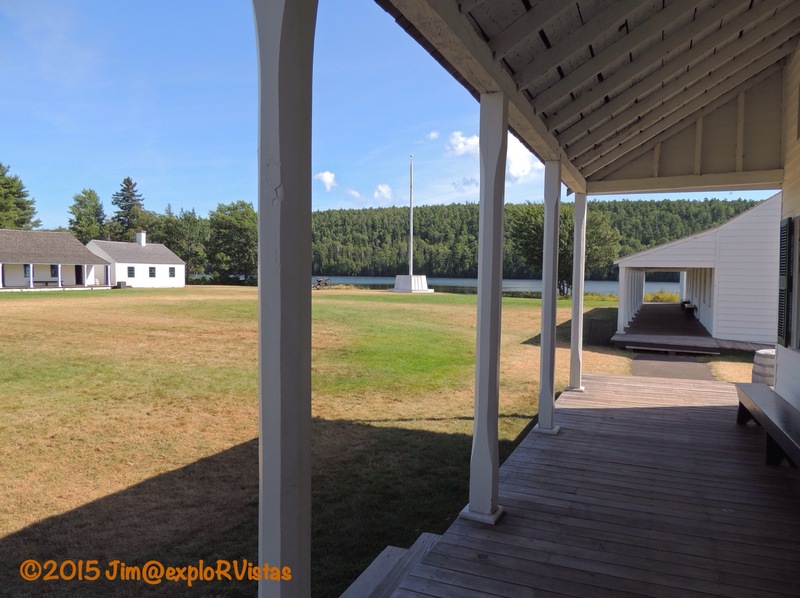 It is on this shore that Fort Wilkins stands, a restored U.S. Army post, built in 1844 as a security measure to protect the national copper interests. Many of the original buildings still stand today. The fort is now a Michigan State Park. 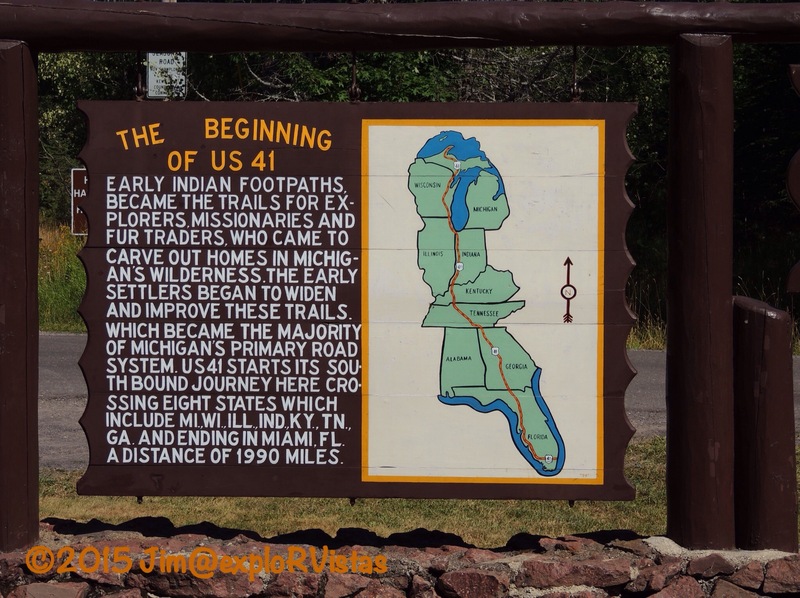 Just beyond Fort Wilkins, US 41 comes to an end…or a beginning, depending on your point of view. Previous PostTo the Top of Michigan We GoNext PostWe’re still “Falling” for each other after 33 years! You make me love Michigan even more. Sounds like you are having a great week. Thanks, Nancy! We are actually back at Wild Cherry now; I have a backlog of material to write about from our U.P. trip. The weather looks delightful, you were lucky ! I love UP michigan, I can’t wait to read more about it ! Thanks, Gin! We did end up having great weather most of the time. We didn’t get out on the peninsula and now I am sorry we didn’t. What a beautiful area that gets a LOT of snow. There is just too much to see in this country! I don’t believe we can stop this life on the road for a very long time:) Thanks for sharing the two mittens! I know what you mean, Pam! We were fortunate to have visited most states before we retired, but there was so much we missed. Just reading your blog has opened up several years worth of great places to go…not to mention all the other blogs we read! Hmmmm…. it’s like looking at my own photo album. We seem to favor a lot of the same subjects, Jim. It should be perfect up there, Ingrid! Do you think you’ll make it up to Copper Harbor? Hope you are feeling better, Ingrid! Have fun and stay well! There were some guests here last week from Michigan and the wife held up her hand to show me where they were from (somewhere by the left thumb). The area you were in looks absolutely gorgeous! Ah the memories of last years UP trip. If I remember correctly during our visit in Copper Harbor we had to drive up to Brockway Mountain Drive to get any phone service. Thanks for letting me revisit some great areas via my computer and couch. More great views! Having lived several years in upstate NY, we know about Black Flies! I never knew so much copper came from there.